Contact us to book your place today! Explore the best waves North Africa has to offer with our Adventure Division and Secret Morocco bodyboard holidays. Running back-to-back they offer an incredible taste of the continent’s finest breaks with few crowds and gloriously warm weather. You’ll discover bay after bay of empty peaks and sleep under the stars before dawn approaches, revealing tubular nirvana. As we travel from break to break the desolate landscape is phenomenal. From wedges and reeling point breaks to playful beach breaks we find secret spots to suit all abilities regardless of swell and tide. Prepare to bodyboard crystal-clear wedges at the foot of cathedral-sized cliff tops and score the last waves of the day beneath glorious sunsets. For further information on the North Africa Adventure Trip click here. 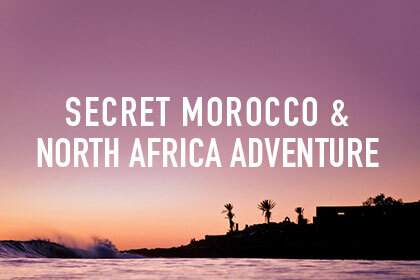 For further information on our Secret Morocco Trip click here.